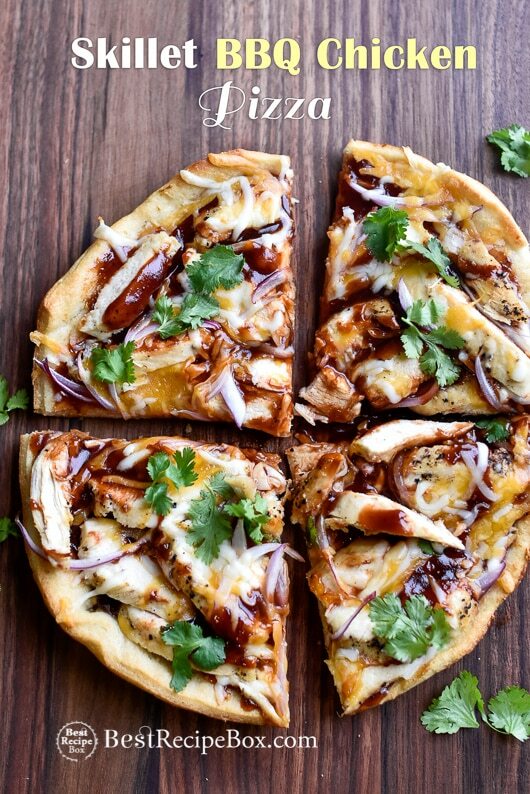 This bbq chicken pizza recipe is truly amazing because it’s crazy delicious and easy! You guys, we’ve tried so many different pizza dough recipes because we figured homemade might be best. But after many pizza making sessions, we truly found the easiest way to make this pizza and it’s with refrigerated pizza dough. No wait! Don’t turn away too quick because the dough is pre-made. It’s actually amazingly delicious, crispy and wonderfully easy. 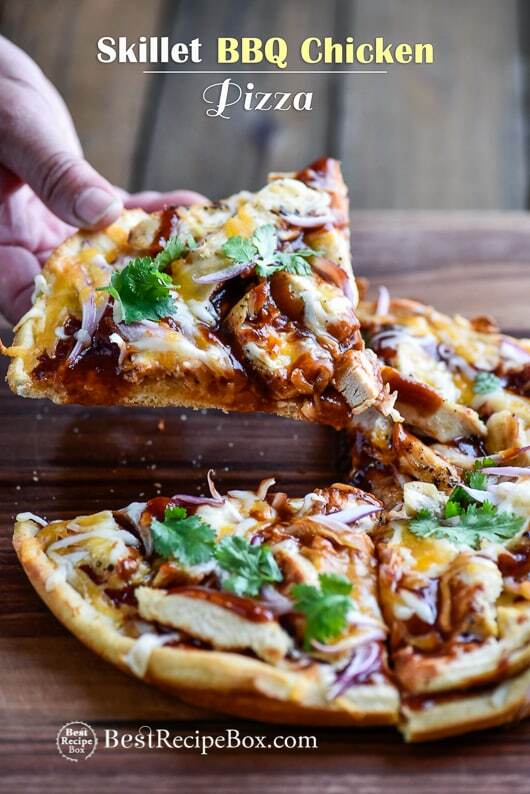 That’s why we wanted to use it for this version of a quick and easy BBQ chicken pizza that’s not only super wonderful to eat, you don’t even know that the dough is pre-made! Now if you happen to have a favorite pizza dough, feel free to use what you love, but we were super surprised by how much everyone loved this version. 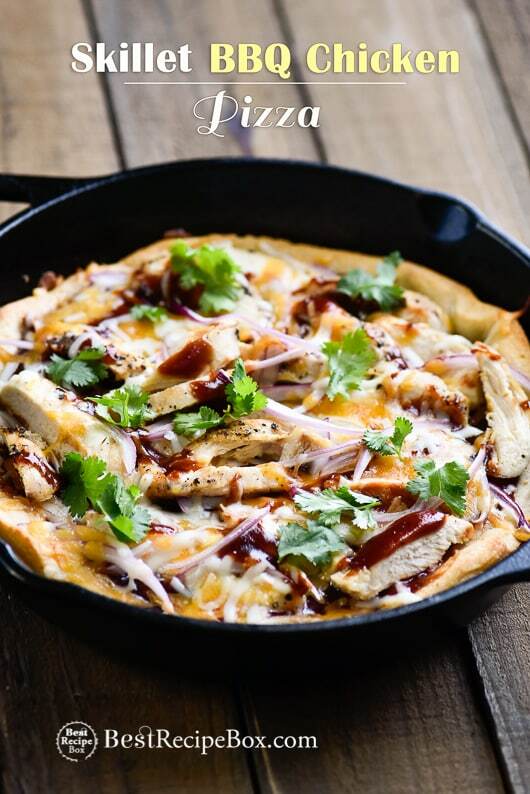 What makes our skillet bbq chicken pizza amazing is because we crisp up the pizza crust with some garlic butter first. YUM! The garlic butter really adds a wonderful flavor to the crust. Then we choose our favorite bbq sauce that has tons of flavor and then we grill the chicken to a perfect juicy texture. 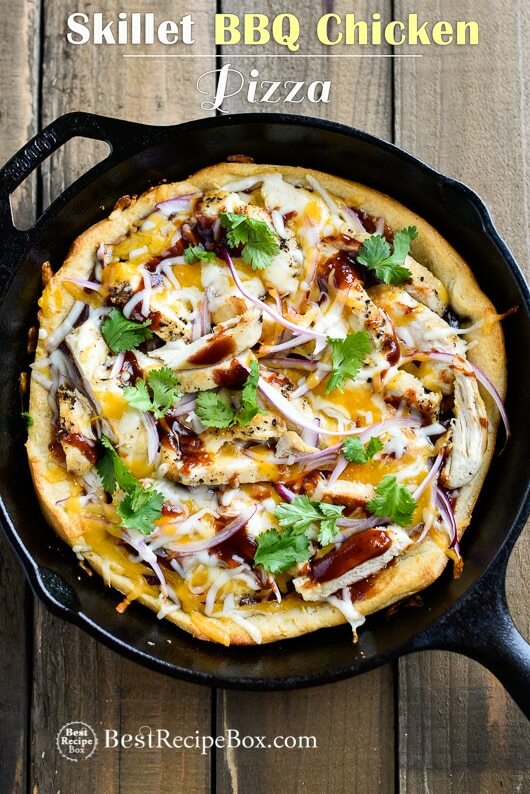 Finally, what adds to the AMAZING-NESS of this easy recipe for bbq chicken pizza is that we cook it all in a cast iron pan. This skillet technique is fantastic and creates a crispy crust that is to die for. And best of all, it’s quick, easy and no flour mess in the kitchen! More Pizza Recipes and Appetizer Recipes. 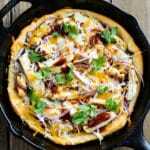 This pizza is great in a cast iron skillet with the refrigerated pizza dough. Just unroll the dough, mark the circle with the cast iron pan (see video in post) and trim off the excess doughcorners. You can also make this with your favorite pizza dough but adjust baking times with different doughs. Heat oven to 400°F. Brush olive oil (or butter) inside a 10” cast iron skillet or other oven safe skillet. Unroll pizza crust dough. Turn the skillet upside down and into press dough to mark the size of the pan. Trim the excess dough. Place the dough inside the skillet allowing the dough to go up the edges slightly. Combine the melted butter and garlic. Brush the top of the dough with the garlic butter. Bake the pizza crust for 15 minutes. While pizza dough cooks, grill the chicken. Season at the chicken with salt and pepper. Heat small skillet on medium high heat. Add oil and then add chicken and cook on both sides for about 5 minutes, or until cooked through. Remove from heat and slice into 1/2” slices. Remove from pizza dough from the oven and top with chicken, red onions and cheese. Bake for another 10-15 minutes or until crust is golden. Add desired pizza toppings and serve warm.